A full-size image (204 KB) is also available. 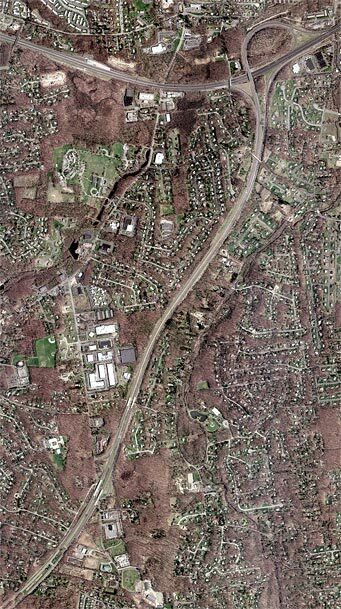 The photo above shows the entire length of the Garden State Parkway Connection, shortest segment of the New York State Thruway system. The New York-New Jersey state line runs diagonally across the lower left corner. Because it leads directly into New Jersey's Garden State Parkway, the Thruway connector does not carry a touring route number, and is therefore assigned the reference route number 982L. 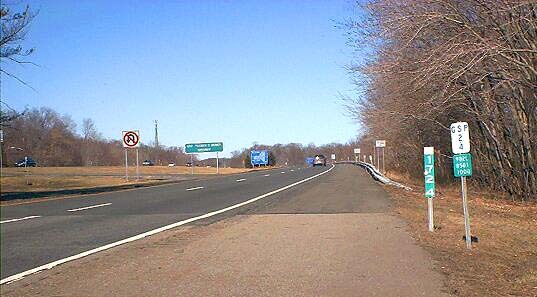 Although NYSDOT reference markers are not, as a rule, placed on the Thruway system, there is one placed at the state line where the Garden State Parkway Connection begins (see photo). On the Thruway mainline, to the west of the Garden State Parkway Connection in the above photo, is the Spring Valley toll barrier. At the present time, tolls are collected from northbound commercial vehicles only. A set of through lanes allows passenger vehcles to bypass the barrier on its south side. The Garden State Parkway Connection includes a single, unnumbered interchange (shown right). It is a half-diamond connection to School House Road (Rockland CR 41, also called Red Schoolhouse Road) in Chestnut Ridge. The interchange provides access to and from Thrwuay points only (including the northbound-only Nanuet exit); it is not available to Garden State Parkway motorists. "...I read somewhere that one of the main reasons for building the Schoolhouse Road partial interchange was that trucks are allowed on the New York Thruway but not the New Jersey portion of the Garden State Parkway. Because of the possibility that a truck might exit the Thruway for the Parkway, not comprehending the truck exclusion in New Jersey, Schoolhouse Rd offers a 'last chance' exit before entering New Jersey."